Product Info for Vortex SPARC AR 1x22mm 2 MOA Red Dot Sight Vortex SPARC AR Waterproof Red Dot Sights provide precision, consistency and speedy target acquisition every time. These compact Red Dot Sights from Vortex have intuitive, rear facing controls for easy access to and instant visibility of adjustments to power and dot brightness. Save battery life with the automatic shut off feature, then automatically return to the last used intensity level when you turn the Vortex SPARC AR Lightweight Red Dot Sight back on. Waterproof, fogproof and shockproof, the Vortex SPARC AR Tactical Red Dot Sight will be your go-to optic for every situation and every rifle. Specifications for Vortex SPARC AR 1x22mm 2 MOA Red Dot Sight: Reticle: 2 MOA Dot Attachment/Mount Type: Multi- Height Mount System Finish: Hard Anodized Matte Condition: New Package Type: Box Included Accessories: Multi-Height Mount System, T-10 Torx Wrench, AAA Battery, Rubber Cover w/ flip caps Additional Features: Rear facing controls Gun Model: AR Magnification: 1 x Objective Lens Diameter: 22 mm Length: 2.9 in Weight: 7.5 oz Eye Relief: Unlimited Battery Type: AAA Height: 5.5 in, 13.97 cm Width: 4.5 in, 11.43 cm Battery Life: Range 300 - 5000 hours Parallax: Parallax Free W/E Travel at 100 Yds: 90 MOA Adjustment Click Value: 1 MOA Lens Material: Glass Lens Finish: Fully Multi-Coated Brightness index: 10 Fabric/Material: Aluminum Alloy Chassis Operating Temperature: Range -4 - 158 Fahrenheit Optical Coating: Fully Multi-Coated Water Resistance Level: Waterproof Illumination Color: Red Adjustment Type: MOA Shockproof: Yes Features of Vortex SPARC AR Waterproof Red Dot Sight SPC-AR1: Optical features: Multiple anti-reflective coatings on all air-to-glass surfaces increase light transmission. Bright Red Dot display is highly visible in daylight. Provides 10 variable brightness settings-the lowest 2 settings are night-vision compatible. Parallax Free. All red dot and holographic sights will exhibit some small amount of parallax. Matching current industry practice, this small amount would be considered parallax free and will make a negligible difference in performance. Construction features: Nitrogen gas purging with O-ring-seals delivers fogproof, waterproof function. Single-Piece compact and lightweight chassis. O-ring seals prevent moisture, dust and debris from penetrating for reliable performance in all environments. Rugged construction withstands recoil and impact, making it shockproof. Highly durable low-glare hard anodized matte finish. Rated from -4 degrees to +158 degrees Fahrenheit. Convenience features: Includes a spacer shim that can be utilized to provide two different mounting heights: lower 1/3 co-witness (40 mm) & absolute co-witness (37 mm). Unlimited non-critical eye relief for rapid target acquisition. 12-hour auto-shutdown feature maximizes battery life. Typical battery life is 300 hours at maximum brightness and 5,000 hours at minimum brightness setting. Related Accessories for Vortex SPARC AR 1x22mm Multi-Coated Red Dot Sight: Vortex VMX-3T Magnifier with Flip Mount Package Contents: Vortex SPARC AR Shockproof Red Dot Sight SPC-AR1 Mount Torx Wrench Hex Wrench Battery Vortex VIP Warranty The Vortex VIP warranty is about you, not us. It's about taking care of you after the sale. VIP stands for a Very Important Promise to you, our customer. We will repair or replace your Vortex product in the event it becomes damaged or defective-at no charge to you. If we cannot repair your product, we will replace it with a product in perfect working order of equal or better physical condition. You see, it doesn't matter how it happened, whose fault it was, or where you purchased it. 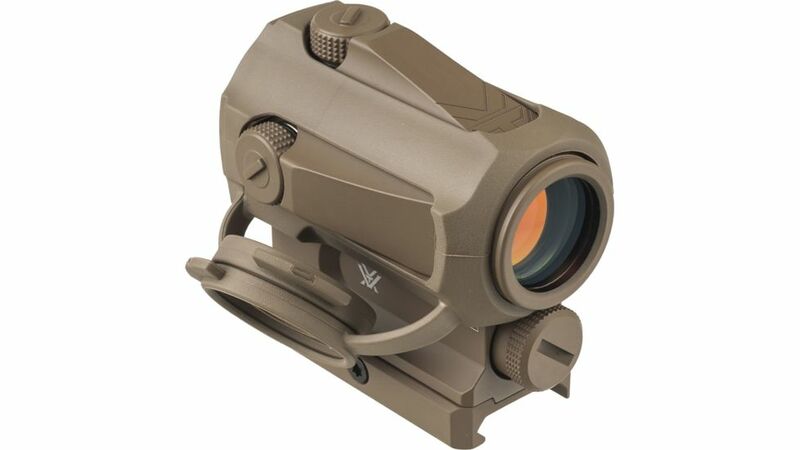 You can count on the VIP Warranty for all Vortex Optics riflescopes, prism scopes, red dots, rangefinders, binoculars, spotting scopes, tripods, and monoculars. Unlimited Lifetime Warranty Fully transferable No warranty card to fill out No receipt needed to hang on to If you ever have a problem, no matter the cause, we promise to take care of you Note: The VIP Warranty does not cover loss, theft, deliberate damage or cosmetic damage that does not hinder the performance of the product.